Muzzle Brake Efficiency: % Leave at 0 for no muzzle brake. 100% would eliminate all jet effect recoil. When I began studying weapon recoil I was surprised to find most of the mathematical theory was from the early 1900's. The formulas from these early texts are still in common use today but they do not jive with current muzzle brake research. Classic recoil formulas greatly underestimate the recoil generated by the exit gas from the muzzle or the "jet effect". Like uncorking Champaign, when a bullet clears the muzzle, gas accelerates and shoots past the bullet. This acceleration of gas out of the muzzle is called the "jet effect" and accounts for approximately 30 to 55% of total recoil energy. PrecisionRifleBlog.com did an excellent series of articles on muzzle brake effectiveness. The graphs below from these articles show how much force is generated by the jet effect. The top blue graph line is recoil force without a muzzle brake. Notice how recoil levels off at 420 pounds when the bullet exits the muzzle. After bullet exit the force jumps to 655 pounds as exit gas blows out of the muzzle. This shows that for the 6XC cartridge in this gun, approximately 36% of recoil force is from the exit gas jet effect [(655-420) / 655 = .36]. A muzzle brake's additional weight will also reduce recoil force, that's why the graph shows these muzzle brakes reduce recoil while the bullet is still in the barrel. This chart is from the PrecisionRifleBlog.com muzzle brake test article with annotations added by me. All recoil reduction that occurs while the bullet is still in the barrel is due solely to the added weight of the muzzle brake. The reduction in recoil highlighted in magenta above is due to a combination of the muzzle brake weight and muzzle brake exit gas redirection. The best performing muzzle brake in the graph above, the Alamo Four Star, reduces peak force by 305 lbs but 180 lbs of that is due to it's additional weight. That's right, 60% of its recoil energy reduction is simply due to adding the muzzle brake's weight to the rifle! Arms and Explosives (1909) used a constant velocity of 3200 feet per second for gas muzzle exit velocity (Arms and Explosives page 20). I believe this "constant" is wholly antiquated when used with today's high efficiency smokeless gun powder. Instead of using a constant I have found a more accurate estimate of muzzle gas velocity is bullet muzzle velocity * 2.4. Adding this to the classic formula brings calculated recoil much closer to modern recoil measurements and muzzle brake tests. I use 2.4 because it matches up to muzzle brake research and super slow motion film shows gas shooting past the bullet exiting the muzzle at over 2.4 times the velocity of the bullet. Note how much faster the gasses exiting the muzzle are compared to the bullet. I was surprised by how much gas gets around the bullet and exits before the bullet. 1. The acceleration of the bullet in the barrel. An equal and opposite reaction to the bullet's acceleration is transferred to the gun. 2. The acceleration of the powder burn gasses inside the barrel. An equal and opposite reaction to the gas's acceleration is transferred to the gun. We use the powder weight because the gas created when the powder burns is equal to the powder weight. We divide the muzzle velocity by 2 because as the bullet moves from breech to muzzle, the powder's center of gravity only moves from the breech to the center of the barrel. 3. The "jet effect" of the powder burn gasses exiting the muzzle. An equal and opposite reaction to the jet effect is transferred to the gun. When a bullet clears the muzzle gas accelerates and shoots past the bullet. This force is the only thing a muzzle brake can act against. A brake's additional weight will also reduce recoil energy (but the additional weight does not affect gun recoil momentum). The momentum of the bullet + gas acceleration + jet effect is equal to the gun's recoil momentum. The above equations assume all powder is burned inside the barrel. A slow burning powder that doesn't completely burn inside the barrel can greatly reduce bullet velocity and recoil from short barreled rifles and pistols because unburned powder imparts no energy to the bullet and has no jet effect. I use QuickLOAD, an internal ballistics program, to select powders that will burn completely in a given barrel length. A light 6.2 pound 308 rifle firing a 168 grain bullet at 2700 fps generates 33.23 foot-pounds of recoil energy. 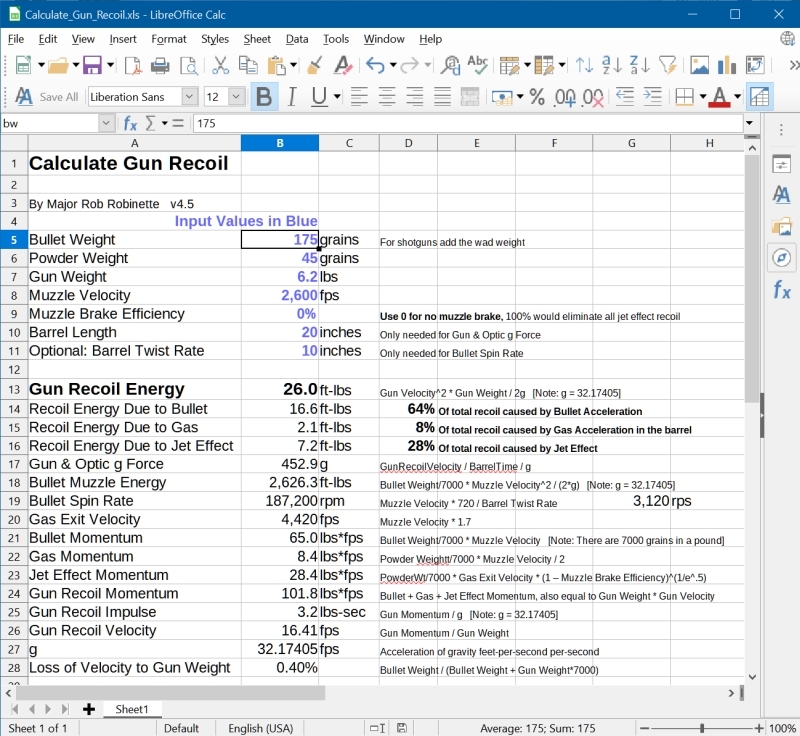 Download the Gun Recoil Calculation Spreadsheet. All other things being equal, a lighter gun will have more recoil velocity and more recoil energy. The Smith & Wesson Model 340 PD 357 Mag revolver with a 2 inch barrel and made of Scandium and Titanium is extremely light at 0.74 lb. It kicks like a mule when firing heavy 357 Mag bullets. Plug in these numbers in the recoil calculator above: 158 gr bullet, 13 gr of powder, 0.74 lb gun weight and 1115 fps (this velocity was measured from a 2" barrel), use 0% for muzzle brake since it doesn't have one. That gives us a very stout 20.5 ft-lbs of recoil energy from this "Airlight" pistol. Fire the same exact load from the S&W Model 686 Plus which weighs 2.3 lbs and the recoil energy drops to a very manageable 6.6 ft-lbs, a 67% reduction in recoil energy due solely to the extra pistol weight! S&W's 357 Magnum Airlight pistols are so light their recoil energy noticeably increases as you empty the gun. Four 158gr 357 Magnum cartridges weigh approximately 0.12 lbs (the 340 PD holds five rounds but one is being fired in this example). For the first shot the pistol + 4 cartridges weigh 0.74 + 0.12 = 0.86 lb which gives us 17.6 ft-lbs of recoil energy compared to the last shot at 20.5 ft-lbs for a 17% increase in recoil energy! The 8 inch barreled S&W 500 50 caliber pistol weighs in at 4.46 lbs and fires a 700 gr bullet at 1300 fps using 27.5 gr of powder. I estimate its barrel ports at 40% efficient as a muzzle brake. Plug those numbers into the calculator above and we get an amazing 70 ft-lbs of recoil energy! The same exact pistol firing a 275 gr bullet with 40 gr of powder will give you 1804 fps of muzzle velocity with a recoil energy of "just 31" ft-lbs. The US Army's M4 rifle using M193 ball ammunition comes in at 6.5 lbs, 56 gr bullet at 3050 fps using 27.5 gr of power and a 10% efficient muzzle brake (flash hider) with a paltry 9 ft-lbs of recoil energy. A 6 lb .22 rifle using a 22LR cartridge: 40 gr bullet, 2.5 gr powder at 1185 fps, no muzzle brake, hits you with 0.17 lb of recoil energy! When I fire my 20 lb Serbu BFG-50 50BMG rifle with a typical 50 cal round, 655 gr bullet, 248 gr powder at 3029 fps, with the muzzle brake removed it generates a whooping 275 ft-lbs of recoil energy. That's why it has a big muzzle brake. Assuming the muzzle brake weighs 2 lbs and is 90% efficient, the recoil energy drops to 113.5 ft-lbs (59% less recoil) which is still a serious kick in the shoulder. All other things being equal, a faster burning powder will generate a "sharper" or "snappier" recoil with a higher peak energy. This can be caused by two factors: more of the powder is burned in the barrel generating more energy and the quicker we accelerate the bullet in the barrel the shorter the recoil energy impulse. Peak recoil energy plays a major part in our perception of recoil. The more secure a gun is when it is fired, the higher the peak recoil energy. A gun mounted in a vise will show a much higher peak energy compared to the same gun fired from the shoulder when standing because the shoulder will move and spread the recoil over a longer time period. The same recoil energy is absorbed by the vice and shoulder but the time in which it is absorbed affects the energy peak. All other things being equal, heavier pistol bullets strike high due to more recoil & more muzzle jump. A shorter barrel can result in higher muzzle pressure and therefore more jet effect. A shorter barrel also reduces weight which adds to gun recoil velocity and recoil energy. Jet effect recoil becomes more prominent with the use of high velocity lightweight bullets. Lightweight bullets generate less recoil but the jet effect is the same so it becomes a higher percentage of total recoil energy. A note about momentum versus energy: Momentum is calculated by simply multiplying weight x velocity whereas energy is velocity squared x weight / 2g [g is the acceleration of gravity feet-per-second per-second and 2g is equal to 64.3481 fps]. This means energy is more affected by velocity--the relationship between energy and velocity is nonlinear so it's not quite as intuitive as momentum. If you double the velocity you don't double the energy, it is quadrupled. With double the velocity the momentum doubles but the energy quadruples. This is why lightweight but high velocity bullets do so much damage and one of the reasons the US Army adopted the 5.56 cartridge for the M16. Muzzle brakes primarily reduce recoil force by redirecting exit gas and minimizing the jet effect but their additional weight also reduces recoil energy. Adding a one pound muzzle brake to a 6.2 pound 308 rifle reduces its recoil energy by 13.9% due solely to the added weight. All other things being equal, the lighter the gun, the higher the recoil energy and the more effective a muzzle brake becomes. Typically, the more powerful the gun, the more effective a muzzle brake becomes. This is why all 50BMG rifles have large muzzle brakes. “The Johnson muzzle brake. This reduces recoil from forty to fifty percent by actual test”, Hatcher’s Notebook p269. PrecisionRifleBlog.com muzzle brake tests show a similar maximum recoil momentum reduction of 44%. Since recoil momentum is not affected by weight we know all 44% of this recoil reduction is from redirected exit gas. The top blue graph line is recoil force without a muzzle brake. Notice how recoil levels off at 420 pounds when the bullet exits the muzzle. After bullet exit the force jumps to 655 pounds as exit gas blows out of the muzzle. In this graph 36% of recoil energy is caused by the jet effect. 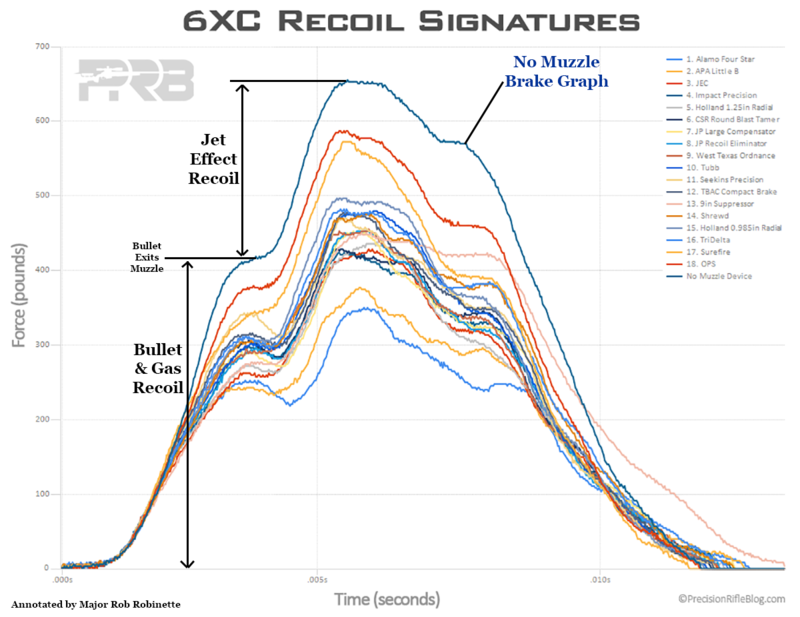 This graph is from the PrecisionRifleBlog.com muzzle brake test article with annotations added by me. Even with a perfectly designed muzzle brake there will be exit gas that will escape through the brake's bore hole. Even so, theoretically a muzzle brake can be more than 100% efficient if it can send enough exit gas rearward to make up for the gas that escapes through the bore hole. Any exit gas that turns more than 90 degrees from the bore axis (rearward) will actually produce force opposite the recoil. A good suppressor or "silencer" can reduce recoil momentum by approximately 25% by slowing gas exit velocity. The added weight of a suppressor will also reduce gun recoil energy.